Excuse me? Yes, um, hi. Sorry to bother you, but there seems to be, um… there’s bread in this salad. Also, there’s no lettuce. In the salad. Yep. It’s true. There is bread, and I mean hunking cubes of baguette, not measly croutons, in this salad. Also there’s nary a leaf of lettuce. In the salad. Nobody panic. 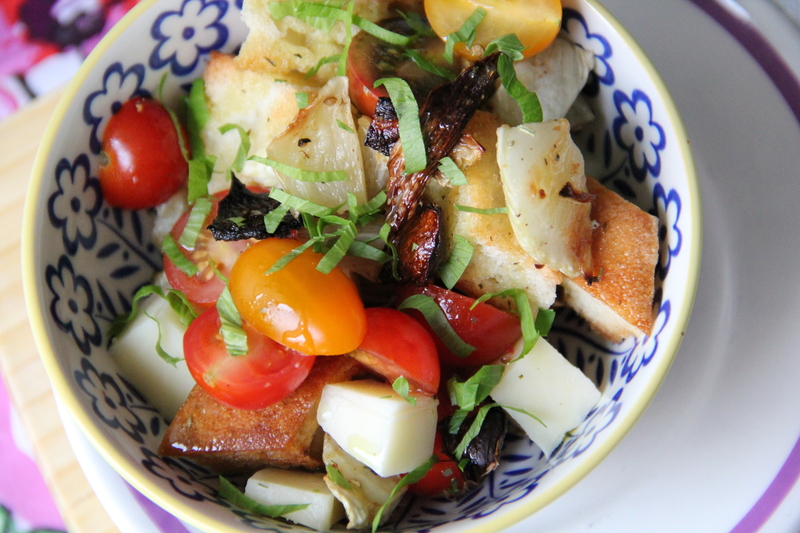 This, my friends, is called panzanella. Hi. Contrary to popular belief, panzanella is not the last name of the newest cast member of the Jersey Shore. Rather, it’s salad of bread and tomatoes, and it is genius. Growing up, I didn’t think bread belonged in salads. Bread, it would seem, belonged in a basket, or a bowl, or possibly in the form of a stick. But bread salad? Jibberish. Rubbish. Poppycock and tomfoolery, served up on a plate! (Doing my best to sound cool and British. How am I doing?) At age nine, give me a salad of bread and I’d give you narrow eyes and a crooked, puckery lip. What the heck is this? Cubes of bread and tomatoes? Where is the salad? I want to go play with my Skip-It and make my little sister draw on the wall in crayon. See ya, panzerella. Zanella. I don’t know, weird. Bye. Oh, youth. So foolish. Except for Skip-Its; those were fun. Now that we’re all older and can appreciate things like chunks of provolone and roasted fennel, let’s get into it. Panzanella. It’s crunchy and fresh and a snap to throw together. Got a few tomatoes? Some old bread? Great, you’re well on your way. Toasting the bread for the salad helps it absorb more of the bright, lemony vinaigrette, and that’s a good thing. Preheat the oven to 400 degrees F. Arrange the bread cubes on a sheet pan and, once the oven is hot, toast the bread until lightly browned and crunchy, about 7 minutes. Transfer the bread to a large bowl, and the arrange the cubes of fennel in a single layer on the empty sheet tray. Drizzle the fennel with some olive oil and sprinkle with salt and pepper, and place in the oven to roast until edges are nice and brown, about 30 minutes. Remove the fennel from the oven and allow to cool slightly. 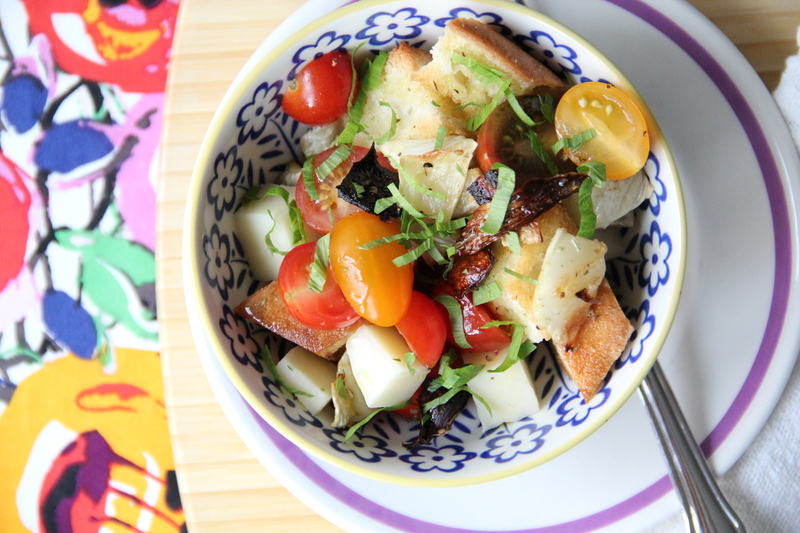 Add the tomatoes, cheese cubes and roasted fennel to the bowl of toasted bread. Now, make the dressing. Put the mustard in a small container with a lid (I used a small glass jar), and add the lemon zest, juice, salt and pepper. Pour olive oil into the jar, secure the lid, and shake like the dickens. When you’re done you’ll have a nice, smooth vinaigrette. Taste it and adjust the seasoning accordingly. Drizzle the vinaigrette over the bread salad and toss to coat. Sprinkle basil ribbons on top. Serve immediately. 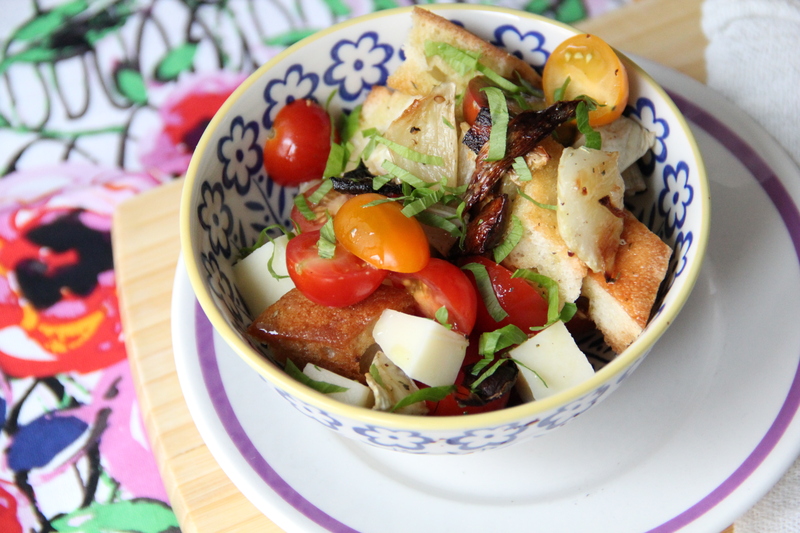 Makes roughly six cups panzanella (serves 4-6). I love panzanella. Actually, maybe I just love bread and like having an excuse to eat it in a salad.